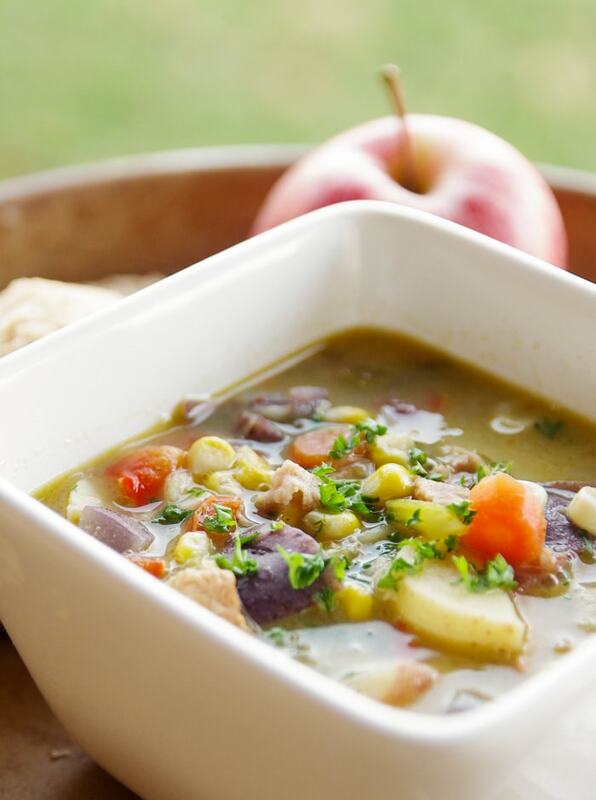 Creamy dairy free potato soup made with thick cut bacon, unsweetened coconut milk and a colorful medley of potatoes. Creamy potato soup is certainly an American comfort food. Most everyone I know likes a good bowl of it on a late winter’s eve with some crusty bread and fruit. Are you with me? I like to make my dairy free potato soup like this slow cooker version using fresh green onion, red pepper, carrots and celery. 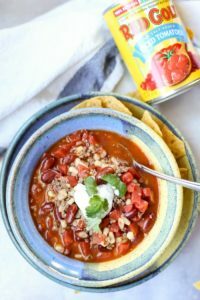 Lately, with my youngest son’s food allergies, I’ve been making dairy free recipes for him that include more protein, so off to the kitchen I went! 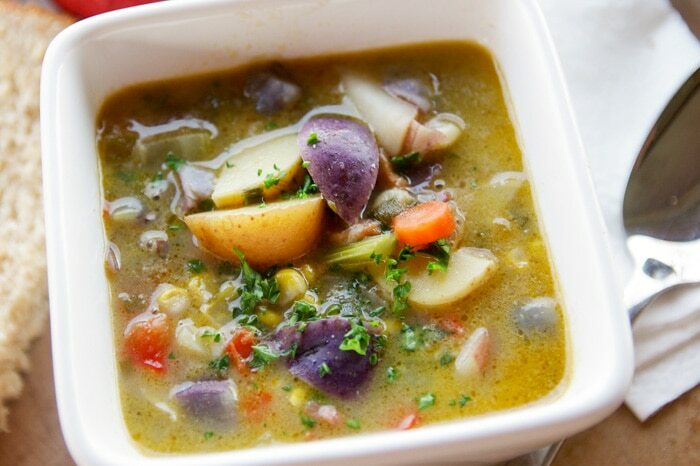 I worked up this delicious dairy free potato soup variation with thick cut bacon, creamy unsweetened coconut milk and a colorful medley of purple, yellow and red potatoes. I was really happy with the result. Flavors were over the top delicious! Use a good vegetable broth instead of chicken. If you want the look of a typical golden potato soup, skip the medley and use only yellow potatoes. 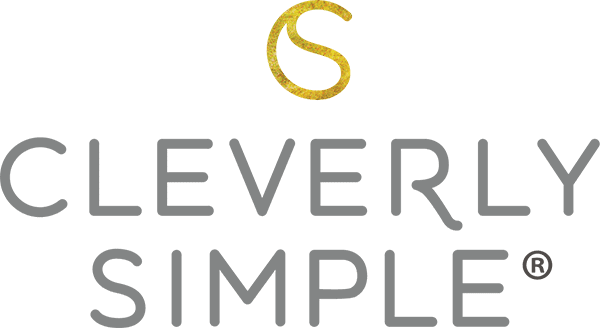 The superlative part of the soup will remain the same… a simple and wholesome weeknight dinner made with fresh ingredients. 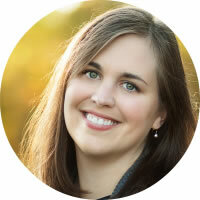 Are you ready to make some yummy dairy free potato soup with me? While your bacon is doing its thing, chop up two bunches of green onions using all of the white parts first and enough greens to make 1 and 1/4 cup. Next, de-seed and chop one whole red pepper and mince three garlic cloves. 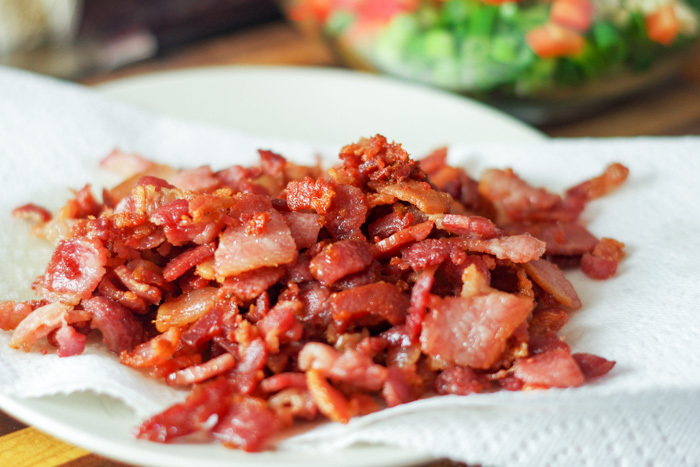 When the bacon is crispy, pour it out onto a paper towel to drain. Leave about 1 Tablespoon of bacon fat in the pan. Here is a shot of our onion, pepper and garlic being sautéed in that bit of bacon fat that will make the base of the potato soup. Stir occasionally on medium heat until the vegetables are fragrant (amazing smell!) and translucent. Turn off the heat to your stove and begin chopping one cup each of celery and carrots. Then the fun part begins! 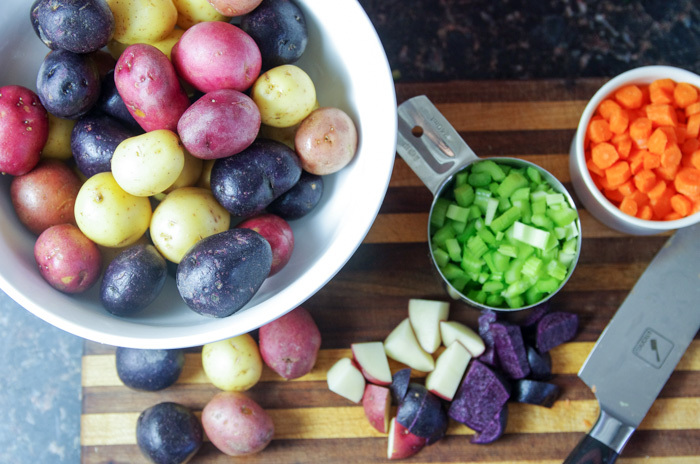 We are going to chop a colorful medley of petite potatoes. Our local grocery store sells 1 lb, 8oz bags of these petite potatoes from Thanksgiving through Spring. Most people roast them at high heat, but the flavor blend of these potatoes deserve to be in a soup! There is no need to skin them first. Simply rinse and roughly chop two bags full (3 lbs total). On medium heat, add the carrots, celery, potatoes and two cups chicken broth to your pot. With the exception of blue, every color of the rainbow is represented here! I just love how colorful this soup is! There is just one more vegetable to add… 1 1/2 cups of fresh (or frozen) sweet corn. 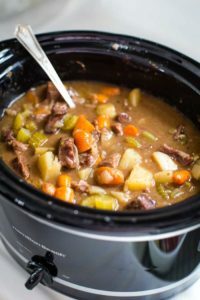 Cover and simmer the soup for 10 minutes or until the potatoes are fork tender. Then stir in 4 additional cups of chicken broth. Now comes the creamy part! Shake and open a can of full fat, unsweetened coconut milk and pour it into your soup. 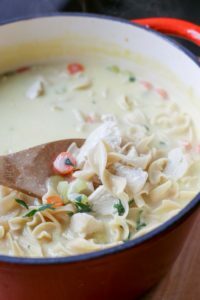 Now, you might be worried that coconut milk will make the soup taste like the tropics have invaded in a bad way, but I promise you the opposite is true! I have made this soup for folks at church and nobody has any clue that there is coconut in there. Just one 14 oz. can mixed in with all the other ingredients adds creaminess, but without a distinctive coconut flavor. Score! Remember our bacon we set aside? If you have any left after little hands have snitched some, add it back into the soup and heat through. I could have taken a picture of the soup right away, but I made it in the afternoon and let it simmer on the stove until dinner… the flavors melded even more, but I noticed the purple potatoes changed the color of the broth. We didn’t mind that at all! When it was time to eat, I sprinkled some fresh parsley on top and served it with … yep, you guessed it…crusty bread and fruit. 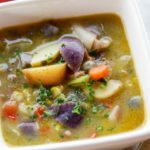 Everyone loved the flavors in this dairy free potato soup. It is a new favorite in our home. 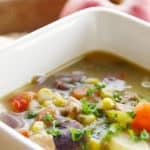 Easy dairy free potato soup made with thick cut bacon, creamy unsweetened coconut milk and a colorful medley of purple, yellow and red potatoes. Roughly chop 16 oz. of thick cut bacon. Saute the pieces in a soup pot until crispy. 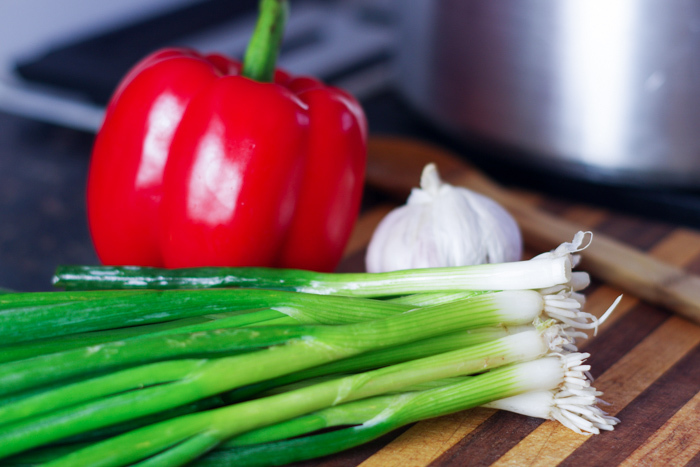 Chop up two bunches of green onions using all of the white parts first and enough greens to make 1 and 1/4 cup total. 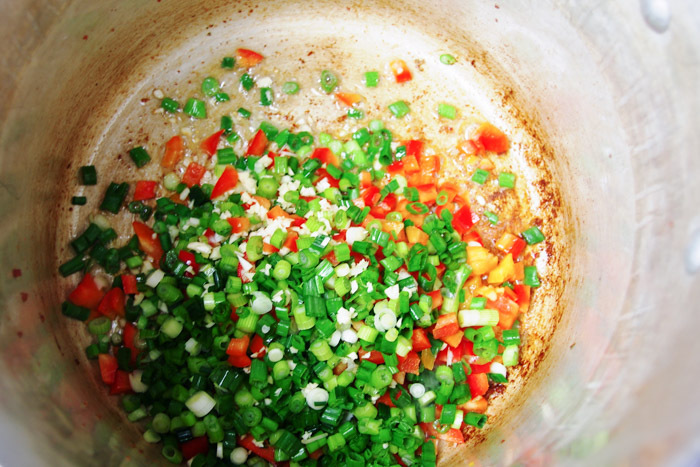 Remove seeds and chop one whole red pepper and mince three garlic cloves. 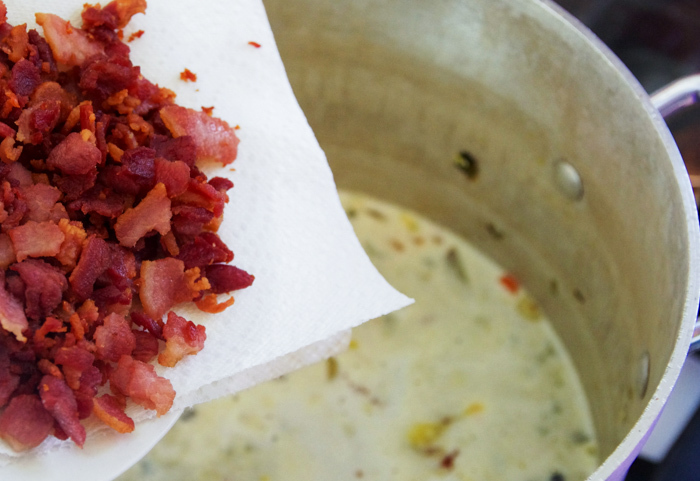 When the bacon is crispy, pour it out onto a paper towel to drain. Leave 1 Tablespoon of bacon fat in the pan. Saute the onion, pepper and garlic in the pan, stirring occasionally on medium heat, until the vegetables are translucent. Turn off the heat and chop one cup each of celery and carrots. Roughly chop 3 lbs. 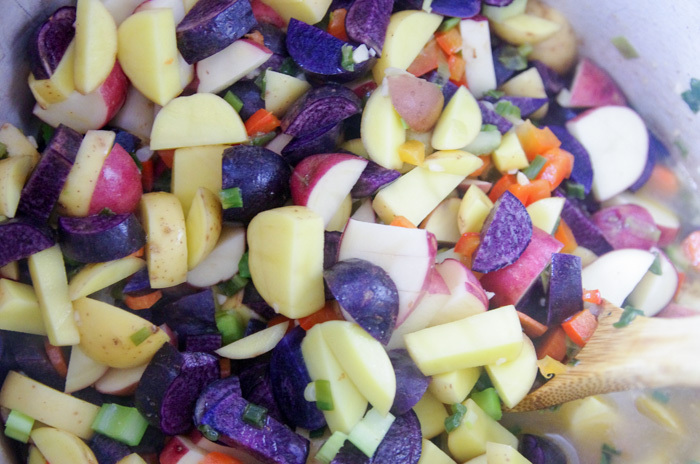 of red, yellow and purple petite potatoes. On medium heat, stir in the carrots, celery, potatoes, 1 1/2 cups fresh or frozen sweet corn and two cups chicken broth. 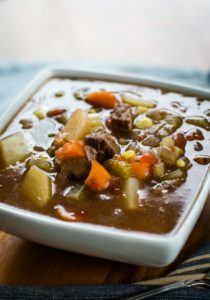 Cover and simmer the soup for 10 minutes or until the potatoes are fork tender. Then add an 4 additional cups of chicken broth. 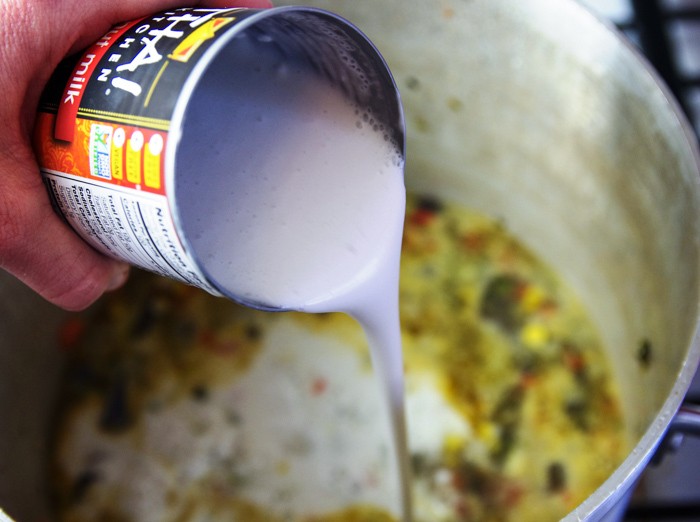 Shake and open a can of full fat, unsweetened coconut milk and pour it into your soup. Add 1/2 tsp. pepper and 1/2 tsp. salt. Add your crispy bacon back in and heat through. I made this delicious soup and took it to work for my Nursing students. They all absolutely loved the texture and the taste with all the added health benefits of the colourful vegetables. It is Autumn here in Australia and the weather was slightly cool, therefore it was thoroughly enjoyed and yes with sourdough bread. Wow! Australia? I’m always amazed at our opposing seasons. Snow is just starting to melt… finally. Thanks for your feedback Glenda!